If you ever see a Philips Norelco on sale for $100, you should buy it, as the Philips Norelco line has a great collection of men’s shavers. 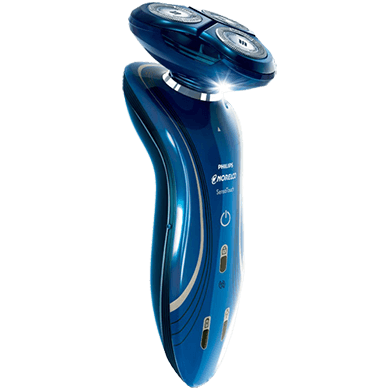 The Philips Norelco Shaver 6400 has been designed in a notable dark blue curved plastic casing, making it easier to hold in the hand. It’s rotary style, and also has a click-on beard styler for when you need it. It can also be used to trim mustache or sideburns. This click on trimmer has five different hair lengths that can be selected. 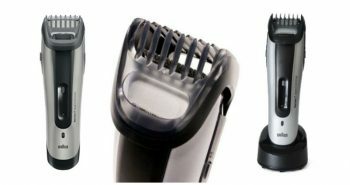 The Norelco 6400 men’s shaver is available for a great price since it does not include an additional cleaning and charging station. This is perfect for the man who wants an affordable men’s shaver, but doesn’t need all the fancy gadgets to go along with it. 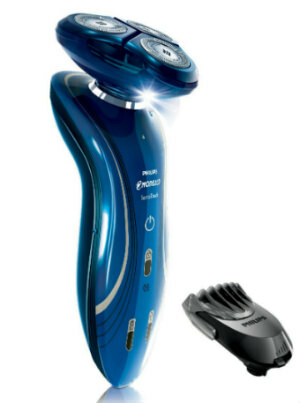 The Norelco product has been renamed the Philips Norelco Shaver 6400, but used to be called the SensoTouch 2D. 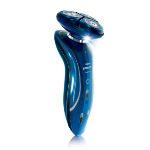 This Norelco 6400 shaver is cordless and rechargeable. 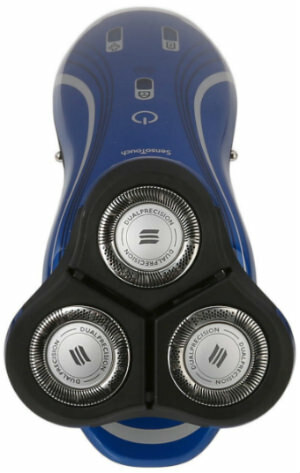 The front of the shaver has an on/off circular button about the central-front. Underneath that is a battery level indicator. This is a two level battery display. It will tell you once the charger has fully charged the shaver up to a full charge. It will also show a low level battery warning indicating that it’s now time to recharge it. This shaver was made with Gyroflex 2D contouring technology, which provides the best skin comfort during shaving. The rotary head surface is flat and smooth with rounded edges, providing for a more effective shave. The rotary head is able to pivot in a circular motion, as well as being able to tilt inwards. It can follow contours and move along every curve of the face or neck. Due to this ability, pressure will be lessened, as well as irritation. This will result in a nice close shave that’s easy on the skin. The back of this shaver has a black non-slip grip, which is helpful as the shaver can be used wet or dry, and the additional details make it easier to clutch, even when it’s wet. The Philips Norelco Shaver 6400 will provide an exceptional shave when wet, particularly when used with shaving gels, foams, lotions, creams, etc., but will also do a great job even when used dry. 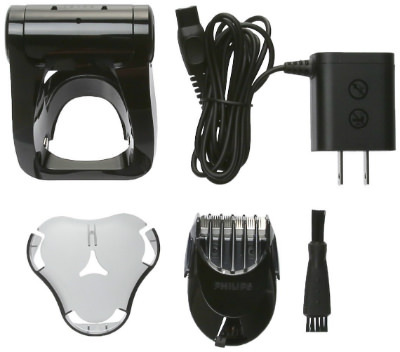 This shaver can be placed into the briefcase or the backpack for convenient shaving anytime. And since it does hold up to a 40 minute charge, there is no need to pack the charger cord, though that does take up minimum space if you do want to pack it too. The shaver can withstand running water, or being in the shower, through its AquaTec seal that keeps water from penetrating inside and ruining the motor. If you drop it in a tub of water it will still be perfectly fine. But it’s not recommended to leave the Norelco 6400 fully immersed for any length of time. The top of this shaver has three rotary heads. Within each are three smaller DualPrecision rotating heads that can trim not only those thick long hairs, but also fine short stubble too. Most hair is trimmed in one pass, so you can avoid shaving the same place over and over again, which also has the advantage of decreasing irritation. Shaving is done with full coverage and complete accuracy. The DualPrecision heads have slots that shave off the normal hairs, and then there are also tiny holes, which can trim the shortest stubble. There is a SkinGlide surface built onto the ends of each of the rotary blades, which enables the shaver to get closer to your skin. This provides an easier way to shave, but still maintains safety and comfort. The smooth surface will also ease pressure and heat. It’s a low friction solution. The blades built into this shaver also have a Super Lift and Cut action. Hairs that are laying low to the skin will be scooped up and snipped, leaving none behind. The blades trim hair to below the skin level, without wounding the skin. Besides the attachable beard trimmer, the box includes a charger cord, a handy wall mount to store your shaver out of the way or to hold the shaver upright during charging, a clear plastic cap to protect the rotary heads, and a cleaning brush. This shaver contains a quality Lithium ion battery. It takes one hour to charge up fully, and this will give you forty minutes of cordless shaving time. If you’ve forgotten to charge it up, and the battery has completely run low, you can do a quick three minute charge in the morning. This will give you enough power for that one early morning cordless shave. Most men will remember to plug it back in after that length of time. To keep the shaver working in optimum condition for many years ahead, it’s recommended that the rotary head be replaced with the RQ11 every 12 months. It also keeps shavers out of the landfills, and saves money from having to buy a new one every year or so, because the internal blades do dull out over time and lose their optimum shaving ability. The Philips Norelco Shaver 6400 men’s shaver is backed up by a two year manufacturer’s warranty. Besides being portable, you can also bring your shaver to many countries around the world. The worldwide voltage feature can be adjusted from 100 volts to 240 volts. You’ll still need to purchase international plugs, though that is minimal cost. 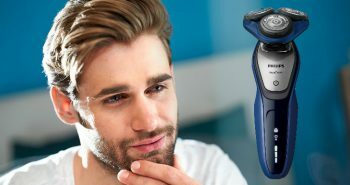 If you’ve been searching for a great men’s shaver, and appreciate how Philips makes a great Norelco line, this may be your best opportunity to have a quick and efficient shave. This shaver doesn’t have a lot of the bells and whistles that more expensive Norelco shavers have, but this is a great entry-level shaver. Once you buy it, you may be ready for a second more expensive purchase, and then you can tuck this one into your briefcase to keep with you at all times.